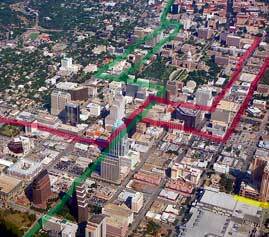 M1ek Dahmus and Michael Schliefke both recently posted aerial views of downtown with some changes penciled in. 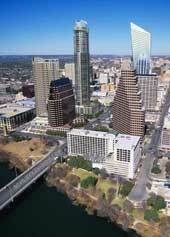 Michael Schliefke, meanwhile, is the first person I've noticed who bothered to paste the various high-rise plans currently in the pipeline into a combined view of Austin's future skyline. (Note whose PhotoShop has the better production values; four years of art school paid off!) God's nose-hair trimmer, AKA the Frost Bank Tower, is about to be lost in the crowd. Michael wonders whether anyone's really thinking about the impact of suddenly having 25,000 über-rich people living in downtown Austin and no effective mass transit, although he does note that all those bare walls might represent an opportunity for artists like him. I'd add that I don't know where those 25,000 childless, lawn-hating, downtown-employed (if employed at all) rich folks are going to come from. I recently got my ears boxed on the Austin Urbanists mailing list for suggesting that, even if all condo projects in sight are pre-selling units faster than they can print contracts, there might be some limit to Austin's supply of rich people. For the record, I consider myself an "urbanist" too. I wish, for example, that Austin's neighborhood associations would stop playing NIMBY and start figuring out how to plan for central Austin neighborhoods that will be liveable when, not if, Austin's population doubles again. I agree with Cap Metro's critics that the rail plan they hoodwinked us into approving in 2004 is a suburban plan, not an urban plan. But I do think there's more than a whiff of "let them eat cake" in the air when M1ek says, "the 'bubble' concerns me not in the least - in fact, the more properties that get built, the better; for those future residents after the bubble pops, that is." It's a nice fantasy that the rich will build Altavida and the Austonian, default on their mortgages when the bubble pops, and then let the middle class move in for pennies on the dollar. I just hope somebody keeps the elevators running. Meanwhile, I wish that a little of the civic excitement going into ultra-high, ultra-hip, ultra-dense housing for the ultra-rich would be channeled into some semi-high, semi-hip, semi-dense housing for the semi-scraping by.